The Mariinsky Ballet is a classical ballet company based at the Mariinsky Theater in Saint Petersburg, Russia. Founded in the nineteenth century and originally known as the Imperial Russian Ballet, the Mariinsky Ballet is one of the world's leading ballet companies. Internationally, the Mariinsky Ballet is most commonly known by its former Soviet name the Kirov Ballet, a title which is still used by the company when touring. The Mariisnky Ballet is the parent company of the Vaganova Ballet Academy, a leading international ballet school. 2.2 Kirov Academy of Ballet of Washington, D.C. The great institution of classical dance was founded by Anna of Russia and funded by the Tsars. Following the October Revolution of 1917, the ballet master Agrippina Vaganova determined to continue the traditions and methods of the Russian Imperial Ballet. Her method laid the groundwork for the formation and development of classical ballet in the world. Carlotta Brianza and Pavel Gerdt of the Imperial Ballet as Princess Aurora and Prince Desire in the 1890 premiere of the Sleeping Beauty. The Imperial Theatre School as it was originally known, was established on May 4, 1738, at the Winter Palace in Saint Petersburg. It would become the predecessor of today's Vaganova Ballet Academy. The school's founder director was the French ballet master and teacher Jean-Baptiste Landé and the purpose of creating the school was to train young dancers to form the first Russian ballet company. The first group of students included 12 boys and 12 girls, who later went on to form what would become the predecessor of today's Mariinsky Ballet. Very little information exists from the formative years of the ballet company, however it is known that both the school and the ballet company were linked by name, becoming the Imperial Ballet School and Imperial Russian Ballet, names that continued to be used until the abolishment of Imperial rule. 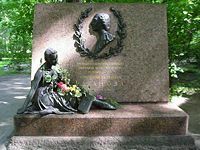 In the late eighteenth and early nineteenth centuries, the Imperial Russian Ballet soon rose to prominence and would employ some of the most influential and famous names in ballet history including Charles Didelot, Marie Taglioni, Christian Johansson, Enrico Cecchetti, Jules Perrot, Fanny Cerrito and Carlotta Grisi. During the late nineteenth century and the early twentieth century, Marius Petipa (1822 – 1910) from Marseille, took Russia by storm and became the chief choreographer for the Imperial Ballet School. Petipa is often given the title "Father of Classical Ballet", and is cited nearly unanimously by the most noted artists of the classical ballet to be the most influential balletmaster and choreographer that has ever lived (among them - George Balanchine, who cited Petipa as his primary influence). Petipa is equally noted for the ballets he created, some of which have survived to the present day in versions either faithful to, inspired by, or reconstructed from the original - The Pharaoh's Daughter (1862); Don Quixote (1869); La Bayadère (1877); The Talisman (1889); The Sleeping Beauty (1890); The Nutcracker (choreographed by Lev Ivanov, with Petipa's counsel and instruction) (1892); The Awakening of Flora (1894); The Calvary Halt (AKA Halte de Cavalerie) (1896); Raymonda (1898); and Harlequin's Millions (AKA Harlequinade) (1900). Petipa also resurrected a substantial amount of works created by other choreographers which had long left the stage of other European theaters. 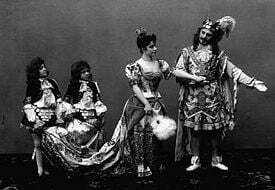 By way of Petipa's productions, many of these works lived on to the present day - Le Corsaire (1856, 1863, 1868, 1885, and 1899); Giselle (1850 with counsel and instruction from Jules Perrot, 1884, 1899); La Esmeralda (1866, 1872, 1886, and 1899); Coppelia (1884, 1894 with Enrico Cecchetti); Paul Taglioni's La Fille Mal Gardée (1885 with Ivanov); The Little Humpbacked Horse (AKA The Tsar Maiden) (1895); and Swan Lake (1895 with Ivanov). There are a number of various divertissements and incidental Pas from Petipa's original works and revivals that have survived in performance even when the full-length work did not, either in versions based on Petipa's original or choreographed anew by others - the Grand Pas Classique, Pas de Trios and Children's Polonaise and Mazurka from Paquita (1881); the Venetian Carnival Grand Pas de Deux (AKA the Fascination Pas de Deux from Satanella) (1859/1870); The Talisman Pas de Deux (1889); the La Esmeralda Pas de Deux (1899); the Diane and Actéon Pas de Deux (1903/1931 in a version by Agrippina Vaganova); The Cavalry Halt Pas de Deux (1896); the Don Quixote Pas de Deux (1869); the La Fille Mal Gardée Pas de Deux (1885/1894); and the Harlequinade Pas de Deux (1900). All of the full-length ballets and individual pieces which have survived in performance are today considered to be cornerstones of the Classical Ballet repertory. Agrippina Vaganova was an outstanding Russian ballet teacher who developed the Vaganova method - the technique which derived from the teaching methods of the old Imperial Ballet School (today the Vaganova Academy of Russian Ballet) under the Premier Maître de Ballet Marius Petipa throughout the mid to late nineteenth century, though mostly throughout the 1880s and 1890s. It was Vaganova who perfected and cultivated this form of teaching the art of classical ballet into a workable syllabus. Her Fundamentals of the Classical Dance (1934) remains a standard textbook for the instruction of ballet technique. Her technique is one of the most popular techniques today. Vaganova was accepted into the Imperial Ballet School in 1888. The old Maestro Petipa cared little for Vaganova as a dancer — any mention of her performances in his diaries were usually followed by such comments as "awful" or "dreadful". In 1915 the Ballet Master Nikolai Legat cast Vaganova as the Goddess Niriti in his revival of Petipa's 1889 grand ballet The Talisman. Vaganova's portrayal was a great success, and won her promotion to the rank of Prima. Nevertheless, she chose to retire one year later to concentrate on teaching. In 1916 Vaganova began teaching at the khortekhnikum, as the Imperial Ballet School was by then known. After the Revolution of 1917 the future of ballet in Russia looked grim because of its tradition as court entertainment. Vaganova "fought tooth and nail", as she put it, for the preservation of the legacy of Marius Petipa and the Imperial Ballet. In 1934 she was appointed director of the khortekhnikum, the school which now bears her name: The Vaganova Ballet Academy. This is the school that prepares dancers to perform with the Kirov Ballet. Through the 30 years she spent teaching ballet and pedagogy, Vaganova developed a precise technique and system of instruction. Tenets of the Vaganova method include the development of lower back strength and arm plasticity, and the requisite strength, flexibility and endurance for ballet. Much of her work was focused on the capability of the dancer to perform a classical pas de deux and the skills necessary for such a performance. In terms of pedagogical training, Vaganova concentrated attention on precision in a teacher's instruction, particularly when to teach what, how long to teach, and in what amount. Following the Russian Revolution, the Soviet government decided that the ballet school and company were unwanted symbols of the tsarist regime and went on to close them both. The ballet company was the first to be re-established, becoming known as the Soviet Ballet, with the school re-opening later as the Leningrad State Choreographic School, both remaining in their previous locations. Following the assassination of the Bolshevik revolutionary Sergey Kirov in 1934, the then Soviet Ballet, was renamed the Kirov Ballet a name which is most commonly used to identify the company to this day. After the end of communist rule, both the ballet company and opera company at the Mariinsky Theatre were linked to the theatre by name, becoming the Mariinsky Ballet and Mariinsky Opera and both companies are run by the theatre itself. Throughout its history, the company has been based at the Mariinsky Theare, which was originally known as the Bolshoi Kameny Theatre, before it was demolished to be replaced by the existing theatre. This is not to be confused with the Bolshoi Theatre in Moscow, which is the home of the Bolshoi Ballet. The Mariinsky Ballet is one of the two or three most significant contributors to the ballet. Some of the world's greatest dancers, such as Vaslav Nijinsky, Rudolf Nureyev, Anna Pavlova and Mikhail Baryshnikov have performed there under the direction of the most important directors in the history of ballet, including Marius Petipa. The Mariinsky Ballet is recognized as one of the world's greatest ballet companies, hiring over 200 dancers, including a reserve troupe and character artists. The Director of the Mariinsky Ballet is Makharbek Vaziev since 1997, when he succeeded Oleg Vinogradov. Modeled on other leading opera/ballet theatres such as the Royal Opera House (London), and La Scala (Milan), both the Mariinsky Ballet and Mariinsky Opera came under the management of the Mariinsky Theater itself, with Valery Gergiev as Artistic Director. He is also the Director of the opera company. Both companies operate as separate units. Kirov Academy of Ballet of Washington, D.C. The Kirov Academy of Ballet of Washington, D.C.is a ballet school that serves students in grades 7 through 12 and offers a high school diploma in addition to its dance instruction. It was founded in 1990 by Rev. Sun Myung Moon under its original name, The Universal Ballet Academy, due to its affiliation with The Universal Ballet in Seoul, South Korea. The name was changed to Kirov when Oleg Vinogradov (former director of the Mariinsky Theatre (or Kirov Theater as it was known during the Soviet era) became the artistic director. The Academy trains students in the Vaganova method since its faculty consists entirely of former Soviet dancers and teachers. The Academy has its own in-house academic and residence program. Students at the Academy can live, eat and attend school, all in the same facility, while focusing primarily on their dance training. The faculty has included numerous former members of the Mariinsky Ballet beyond Vinogradov, it founding Artistic Director. Graduates of The Kirov Academy include Sascha Radetsky, Rasta Thomas, Michelle Wiles, Danny Tidwell, Tyler Nelson, Oscar Hawkins, Maria Bystrova, Adrienne Canterna and Ashley Canterna. ↑ Lynn Garafola. Legacies of Twentieth-century Dance. (Wesleyan University Press, 2005. ISBN 0819566748). books.google. Retrieved February 20, 2009. ↑ The Kirov Academy of Ballet of Washington, D.C.. Retrieved February 26, 2009. Wiley, Roland John, ed. and trans. A Century of Russian Ballet: Documents and Eyewitness Accounts 1810-1910.. Oxford University Press, 1991. ISBN 9780193164161. This page was last modified on 15 August 2018, at 15:42.